(Brassica napus) 40 days. Beautiful plants grow 2 ft. tall. 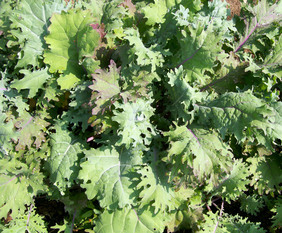 Mild, tender leaves have purple-pink veins lightly tinged with purple on the margins. In cold weather the leaves turn reddish purple and are very attractive. Less cold-hardy (15°F) than most kales. Pkt (2 g).